This year’s EMRS Spring Conference will be held in Lille, in the northwest of France, and will be the largest yet. 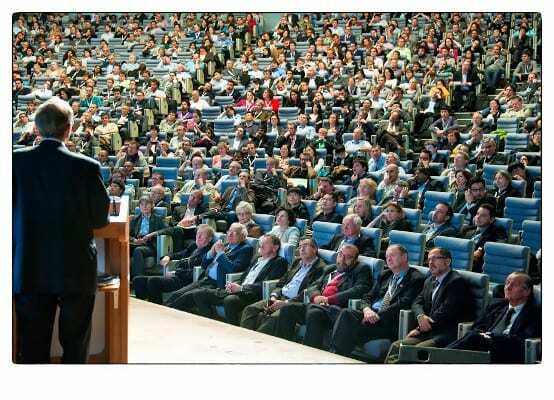 The audience at the 2013 EMRS Spring Meeting – this year’s, to be held in Lille from the 26th to the 30th of May, will be the largest yet. Online registration for this conference has now closed, but it is possible to register on-site. Click here for more information. The Spring Meeting, held each year in May or June since 1983, is the main conference of the EMRS. This year, it will be held in the Congress Center in Lille, France, from the 26th – 30th of May. Conference registration is open now, and will remain so until the 13th of May – you can register here now. The 2014 meeting will be the biggest yet organised, with over 30 parallel symposia being held over the four days.Each symposium (details of which you can find in the program) will publish its own proceedings of the event, in journals such as physica status solidi (a) and (c), and Thin Solid Films. The conference will be be chaired by Ian Boyd, of the University of Brunel in the UK, Gilles Dennler, Head of Energy and Environment at IMRA Europe, Roberto Faria of the University of São Paulo, Roberto Fornari of the University of Parma, and Elvira Fortunato, of CENIMAT-I3N in Portugal. The plenary session will take place on May the 28th, beginning at 4pm, will be introduced by new EMRS president Thomas Lippert. It will then be addressed by Christian Bataille, member of the National Assembly of France, Henning Sirringhaus of the University of Cambridge, Alain Astier of STMicroelectronics, and Jordi Arbiol of ICMAB CSIC. Professor Sirringhaus will present his work on organic and oxide semiconductors – understanding their device and charge transport physics, with a focus on the microscopic processes that limit field-effect mobility. Professor Astier will talk about the strength of the european microelectrics clusters, and their decision to set up a “single cluster voice” to represent their interests within the Horizon 2020 initiative. Finally, Professor Arbiol, winner of the EU-40 materials prize, will take a journey to the nanoworld through electron microscopy, presenting new techniques that allow sub-0.05 nm resolution. A bilaterial conference, held in cooperation with the MRS, and chaired by Hans Richter of GFWW in Germany and William Tumas of the American National Renewable Energy Laboratory, will also be held during the Spring Meeting. Its plenary session will feature three presentations. The first, by Peter Green of the University of Michigan, will discuss research to understand the connection between structure, transport and device performance in thermoelectrics and organic solar devices. Henry Snaith of the British Clarendon Laboratory will take the second, which will be on research into perovskite solar cells. Finally, Markus Fischer of Hanwha Q Cells in Germany will introduce the SEMI International Technology Roadmap for Photovoltaics, and the challenges it presented for suppliers and manufacturers. Several awards will also be presented during the conference. The EMRS EU-40 prize, for outstanding research performed by researchers under 40, will be awarded to Jordi Arbiol, who will also deliver the plenary talk discussed previously. The Graduate Student Awards, to be presented after the plenary session on the 28th, are intended to honor and encourage graduate students whose academic achievements and current materials research display a high level of excellence and distinction. Finally, the reach.out award, for any member of the European materials research community who has been active in public outreach activities in the EU between the 1st of January 2013 and the 28th of April 2014 will be presented. Nominations for this final award are still being accepted, with the 15th of May as a deadline; click here to submit.